Several examples of the new Bounce Eclectus Mushroom – Image by Michael Vargas. 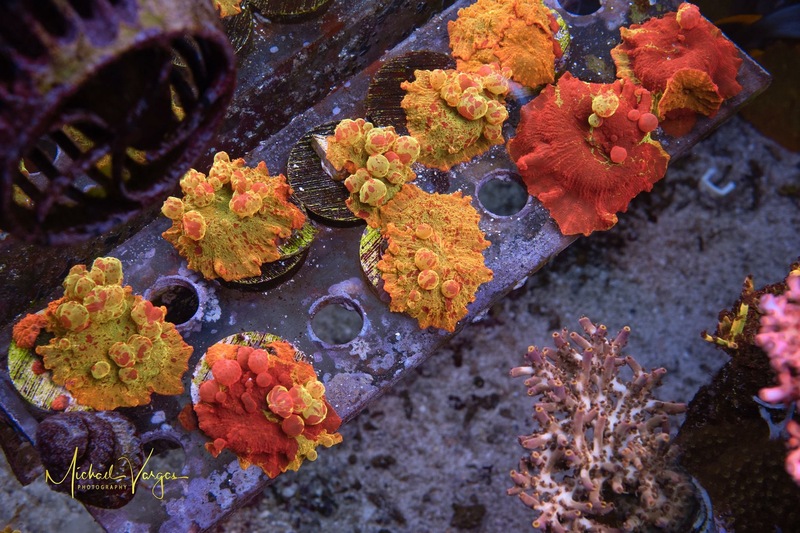 Corallimorphs, particularly the mushroom polyps of the genus Discosoma, seem to go in and out of vogue depending on which way the current blows, and aquarists tend to either love them or hate them based on how restrained or invasive their population becomes in their tanks. Still, this generally hardy and usually easy-to-keep group occasionally yields something new that universally wows. The full article appears in the March/April 2019 issue of CORAL. Click to buy the back issue now! The Eclectus Mushroom, a Discosoma sp. morph discovered in Indonesia and exported by Bali Aquarium, took the reefkeeping world by storm back in 2015. 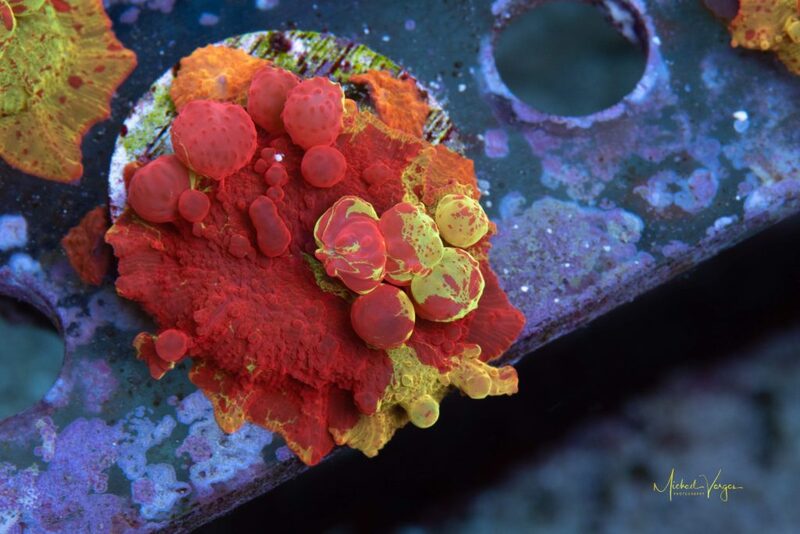 A variation on the already coveted Jawbreaker Mushroom, the Eclectus Mushroom’s strikingly marbleized pattern of vibrant red and yellow-orange with occasional hints of lime green may be singular among corals and is a welcome diversion from the more common coral color palette. In the same vein, the “Bounce Mushroom” craze has catapulted the genus Rhodactis into the spotlight in recent years, with polyps developing dramatically enlarged bubble-like growths that are sometimes suggested as some sort of coral tumor, although disease may not really be what’s occurring. It has been hypothesized by Jake Adams of Reef Builders that being heavy-handed with lighting in the blue spectrum seems to be a trigger for a normal Rhodactis to shift in growth form to develop these swollen vesicles, the process and result now generally referred to as “bouncing” in the aquarium hobby. Now, these two divergent trends have collided in the revelation of the so-called “Bounce Eclectus” Mushroom, brought to our attention by Thinh Vu, proprietor of Mythical Corals, a small hobby-business located in Grand Prairie, Texas. Simply put, the Bounce Eclectus represents the formation of enlarged growths on a Discosoma mushroom, a phenomenon not nearly as prevalent in this genus as in Rhodactis. This Bounce Eclectus Mushroom from Mythical Corals is one of a few that has developed extensive red coloration. Image by Michael Vargas. How did Vu discover this new coral? Have any been released into the aquarium hobby? Want to see more of Michael Vargas’ fantastic photos of the Bounce Eclectus? 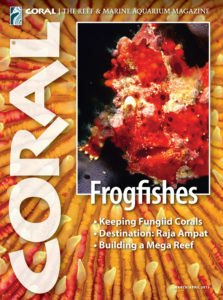 Get the answers in the March/April 2019 issue of CORAL. Print subscribers got the scoop in their mailboxes, but you can buy this issue now! All subscribers can read the story in our digital edition, or you can subscribe to one one of our apps!